The golden sands of Coromandel proved to be golden in more than just their colour, and early mining efforts focused on alluvial beach and stream 'placer' deposits. It was quickly realised, however, that the vast bulk of its wealth remained hidden under the dense subtropical jungle-clad slopes of the Coromandel Ranges. After the conclusion of negotiations with the native Maori land owners in 1862, the Coromandel hard-rock gold rush was on! Dozens of bonanza grade quartz reefs were claimed in the following years, with some of the largest and richest finds in the world being made. Roam through Coromandel's subtropical native forests, home majestic Kauri trees and many spectacular waterfalls. Explore some of the many old mine tunnels and examine the gold bearing rock up close with your geologist guide. Visit the relics of the area’s colourful gold mining past and tour a working gold mine. Hunt for gemstones (quartz crystals, colourful agates and more) beside a beautiful clear stream in the picturesque Kauaeranga Valley. Relax on beaches or play in sea, then enjoy the region's fresh local food and wine. All of this while enjoying some of the best scenery New Zealand has to offer! Check out some of our tour options below, then we can customise an itinerary to suit your requirements. Thames Gold Mine Experience and Thames School of Mines. Or, visit the beautiful Kauaeranga Valley and hunt for minerals and gems. Karangahake Windows Walk, explore historic mine tunnels and relics in a spectacular location brimming with history. Take the Waihi Gold Mine Tour and visit the Gold Discovery Centre or the Waihi Art Centre and Museum. Or, visit beautiful Waihi Beach. Walk to serene Orokawa Bay, examine quartz-gold reefs exposed on the rocky headlands, or relax on one of new Zealands most beautiful beaches. Then continue to the Pacific coast of Southern Coromandel, taking the coastal highway north and then back over the Coromandel range to Thames. Beach (Waihi Beach/Whiritoa/Whangamata), cafe, and scenery/photo stops also highly recommended. Allow 6 hours including drive time Auckland-Thames return, or 2-3 hours if combined with other Coromandel destinations. Thames was the centre of mid-19th century gold mining in the Coromandel region. The township is nestled between the Firth of Thames and the bush-clad Coromandel Ranges, which rise sharply on the eastern edge of the town. These hills host several significant bonanza grade gold mines, including the Golden Crown, Caledonian, and Waiotahi mines. Thames is located about 1.5 hours from Auckland City. Crossing the Hauraki Plains, the rugged bush-clad, volcanic spine of the Coromandel Ranges rise up the ancient swamps of the plains. There is gold in them-thar hills... Thames town is filled to over flowing with history of its gold mining-past, recommended stops are Gold Mine Experience Tour, the Thames School of Mines and Mineralogical Museum, and nearby Kauaeranga Valley offering many short scenic walks and opportunities for mineral fossicking. The Gold Mine Experience Tour is conducted in a historic but still working gold mine. The site was once one of the richest hard-rock gold fields in New Zealand: the combined Caledonian - Golden Crown - Manukau claim. The Hauraki Prospectors Association Incorporated (HPA,) was formed 30 years ago by a several retired gold miners, the prospectors held a firm belief that gold was still to be found - "gold fever" was still running high... 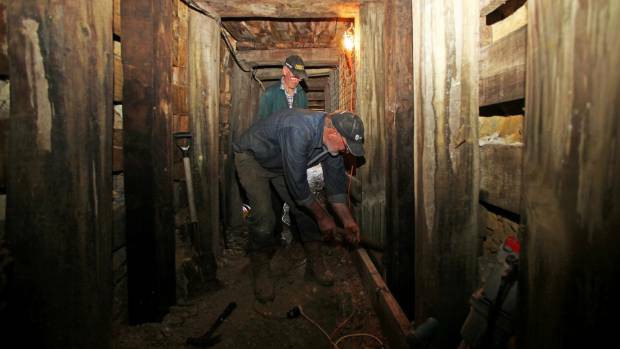 The original buildings and equipment were repaired and restored by the group, and the mine tunnels reopened. The mine is now being worked by HPA members, who also volunteer to conduct the tours. The mine is currently being driven to 100-200 feet below sea-level, with new gold having been discovered. This mine is quite rich by world standards, running at an average of 1oz gold/ton. This is a working hard-rock underground gold mine, being mined and processed with genuine 19th century methods and equipment by highly enthusiastic and knowledgeable miners. This is a must-see experience for anyone with an interest in gold, history, or geology. Tour length: approx. 40 minutes. Thirty National Schools of Mines were established throughout New Zealand during the late 19th century during the peak of New Zealand's gold mining years, teaching subjects such as Mathematics, Mining and Applied mechanics, Practical Assaying, Ventilation, and Explosives. The Thames School of Mines was opened in 1886 and is nationally significant as a rare and best example of a School of Mines still open to the public. The original school buildings look (and smell!) much the same as they did in the past, and feature authentic period equipment and laboratories. The large Mineralogical Museum, which adjoins the school, opened in 1901 and holds one of the best collections in the Southern Hemisphere, holding over 3000 specimens which include fossils both from New Zealand and abroad. There is also a popular and very reasonably priced gem and mineral shop attached to the Mineralogical Museum. There is a Thames School of Mines Guided Tour which takes approximately 1 hour, or feel free to just enjoy the School of Mines and Museum at your own pace. Kauaeranga Valley is 15 minutes from Thames Township and offers a variety of walks to suit all abilities. The valley was logged for Kauri in the late 19th and early 20th century, and many relics from these acivities; since then the native bush has regenerated, through hich there are many picturesque walk. Another popular activity in the valley is fossicking for rocks and minerals in the Kauaeranga River and its tributaries. Allow 6 hours including drive time Auckland-Thames return, or 1-2 hours if combined with other Coromandel destinations. A picturesque 35 minute drive south from Thames down the western edge of the Coromandel Ranges, or 2 hours from Auckland, the rugged and picturesque Karangahake Gorge hosts several extremely rich gold reefs near the confluence of the Ohinemuri and Waitawheta Rivers. Today the gorge is wild and bush clad, however it was a hive of industrial activity at the height of its mining boom years in the late 19th century. The workings of the large Talisman Mine are currently being re-investigated, with newly proven gold resource estimates are on the order of 100's of millions of dollars, and will likely rise to several billion as geological investigations continue. Sections of the old workings of the Talisman, Woodstock, and Crown mines, as well as underground tramways and engine rooms, are now also open to the public and are part of the highly recommended Windows Walk (flashlights/torches required). The 'windows' refer to openings driven out to gorge face, allowing visitors walking along the underground tram way to look out and down to the beautiful clear river below. The expansive stone ruins of the historic ore processing plant are now being taken back over by the native bush, and is a surreal place to explore with many excellent photo opportunities. We'll also keep an eye out for any clues in the rock which might be helpful for any budding hard-rock gold prospectors in the group! A possible add-on for this trip for very intrepid groups could include exploration of one of the several historic mining areas hidden in the dense bush of the Coromandel ranges between Thames and Karangahake. A good level of both rough country hiking experience and physical fitness is required, as is appropriate footwear and clothing. Access to these areas is through thick bush and rocky creek beds which is both difficult and weather dependent. Waihi gold town - three active gold mines, one amazing beach. Allow 7 hours including drive time Auckland-Thames return, or 2-3 hours if combined with other Coromandel destinations. 15 minutes drive from Karangahake or 2 hours from Auckland, Waihi is home to the largest gold and silver deposit in the Coromandel Gold field. Since its discovery in 1878, the world class Martha Hill gold mine has yielded more than 6.4 million ounces of gold, and 40 million ounces of silver from the rich mineralised reefs which plunge steeply beneath Waihi Township. Historic Waihi town is nestled in the foothills of the southern terminus of the Coromandel Ranges, and is only ten minutes drive from one of New Zealands best beaches; Waihi Beach. Waihi was literally built on top the huge Martha Hill gold and silver depost. The reefs extend deep below the township itself and were mined via underground methods to a vertical depth of up to 600 metres below. These veins are now mined via a large pit in the centre of town, with two recent gold-silver discoveries now being mined via underground methods a couple of kilometres to the east of Waihi township. Waihi Gold Mine Tour: a guided tour which takes visitors "inside the fence" of the working open pit Martha Hill mine, visit the ore processing plant. Tour length: 1.5 hours. Beautiful Waihi Beach: Waihi Beach was also the focus of early gold exploration and some very small scale historic mining. There is a walkway beginning at the north end of the beach which traverses the rocky headland and arriving at stunning Orokawa Bay. This bush-clad trail offers spectacular views over pacific ocean and Orokawa Bay wild, beautiful and serene, and well off the usual tourist trail. There are several gold bearing reefs in the headland with excellent exposures on the at the base of the headland, along with 3 small prospecting drives. The track to Orokawa Bay is easy and and well formed, however access to the gold reef exposures and mining adits are more difficult, require at least medium levels of agility and fitness. walk to Orokawa bay 45 minutes each way, plus time spent enjoying the bay and any off track geology excursions. Visit the popular Waihi Gold Discovery Centre and/or Waihi Arts Centre and Museum. Recommended add-on's for this trip: Scenic tour north along Coromandel's pacific coast including stops in Whiritoa and Whangmata. Coromandel Town: Coromandel Goldfield Centre and Stamper battery, Success Mining Area, Tokatea Mining area, Driving Creek Railway, Coromandel Mussel Kitchen. *The Northern Coromandel Gold Tour is highly recommended as a second day addition (with an overnight stay in Coromandel) to the Southern Coromandel Package due to the longer driving times to and from Auckland. Although more remote, the Northern Coromandel is a spectacular destination and not to be missed. Work is still in progress in this section.